Whether you are trying to create a basic whipped cream to add a dollop to pies or a stabilized whipped cream frosting to decorate an "Over the Hill" cake, the addition of black coloring can be a challenge. While experimenting with a combination of the three primary colors -- red, blue and yellow -- in your standard food coloring set can create black whipped cream, true black food coloring creates the best quality black. Place your mixing bowl and whipping attachment in the freezer for 15 minutes prior to making your whipping cream. Leave the heavy or whipping cream in the refrigerator until right before use. The colder the bowl, attachment and cream are, the better your whipped cream comes together. Assemble the stand mixer with the bowl and attachment in place. Place your whipped cream ingredients, typically a combination of heavy or whipping cream, vanilla and powdered sugar, in the cold mixing bowl. Add one to two drops of liquid black food coloring or, if using a paste, stick a toothpick into the paste to collect a small amount to add before mixing begins. Set your mixer to whipping speed and continue to whip until your cream forms stiff peaks, which typically takes about five minutes. If, after mixing begins, you notice your black color is not yet dark enough, slowly add a few more drops of food coloring or another bit of paste while the mixer is running. Continue until you reach the desired shade of black. Set up your mixer with the cold bowl and attachments the same as you would when making basic whipped cream. Combine ingredients in the bowl and add one to two drops of liquid black food coloring or, if using paste, stick a toothpick into the paste to collect a small amount. Add 1 to 2 tablespoons of dry pudding mix powder to the mixing bowl. 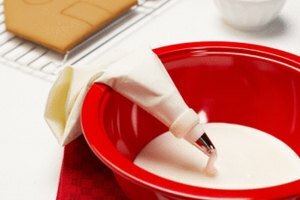 Pudding mix helps to stabilize and firm up the whipped cream, making cake decoration and piping easier. If a chocolate flavor works for your recipe, consider using chocolate pudding mix as the darker color will help your create the rich black color you are looking for. Turn the mixer on and whip until stiff peaks form, which typically takes three to five minutes. Food coloring paste does not add any liquid amount to your whipping cream and because of this, often results in a rich black color without any compromise to the consistency of the whipped cream. 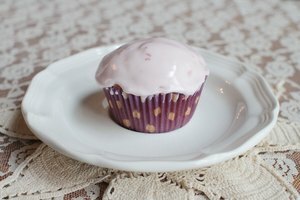 Black food coloring, in large amounts, can create a slightly bitter flavor. To compensate for this, consider adding an extra tablespoon of powdered sugar at the beginning or a bit of cocoa powder for chocolate whipped cream.